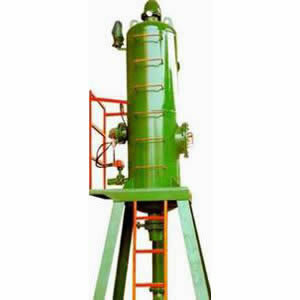 Our gas liquid separator is the solid control equipment for the first stage degassing of gas invaded mud. It is primarily used for removing the big bubbles with the diameter ≥Φ3mm. Most of these bubbles are the expanded gas in the drilling fluid filled in annular of wellbore. If the bubbles are not removed timely, they may cause well kick. Using our gas liquid separator, you have no need to worry it. Inlet pipe 5" 5" 5"
Outlet pipe 10" 10" 10"
Gas discharge pipe 8" 8" 8"
As an API certified manufacturer of oil drilling equipment, Rugao Yaou Company has the capacity of providing quality wellhead control equipment, workover tools, and drill rig parts at low prices. Benefiting from the features of stable performance and great durability, our products are extensively used in Libya, Egypt, Turkey, India, and Brazil, just to name a few. Interested in our solid control equipment? Welcome to contact us.